some of the attractions awaiting them inside. 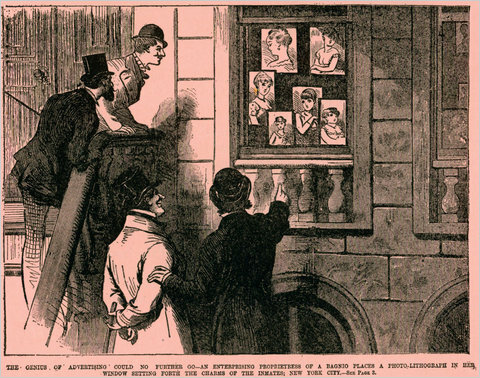 "During the first half of the nineteenth century, most efforts to con­trol or eliminate prostitution originated in private moral reform organi­zations. In the 1850s, however, the state intervened for the first time on a significant scale. In September and October of 1850, with the sup­port of two police court justices, the district attorney, and the future head of the Five Points Mission, police raided Five Points. During a five-week period, Captain John J. McManus brought indictments against over forty brothels and their proprietors. The massive sweeps provided an environment conducive to evangelical reform and were partly respon­sible for the establishment of the Five Points House of Industry in 1854. Within two years, the Reverend Louis Pease embarked upon similar efforts to eradicate what he considered to be the sexual jaundice in the nation's foremost slum. "During his initial term as mayor, from 1855 to 1858, Fernando Wood became New York's first chief executive to seek elimination of gambling and prostitution from certain parts of the metropolis. 'Chief among the civic notabilia is the Mayor's foray or razzia among the unhappy fallen women who perambulate Broadway,' recounted George Templeton Strong, who questioned the legality, if not the motives, of Wood's actions. 'What the Mayor seeks to abolish or abate is not the terrible evil of prostitution, but simply the scandal and offence of the peripatetic whorearchy.' In other words, the mayor moved only against poor street­walkers, not the chic brothels of Leonard, Church, and Mercer streets. Wood was 'popular for his courage in taking the responsibility of action unsupported by precedent and statute,' continued Strong. ' So rise dictators in degenerate commonwealths.' "